Sweet Liber-Tea [C8821] - $10.00 : Yarn Tree, Your wholesale source for cross stitch supplies. Cross stitch pattern by Silver Creek Samplers. 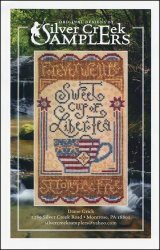 A patriotic tea cup is surrounded by stars and stripes and the verse "Sweet cup of Libertea." The phrase "Forever we'll be strong and free" borders the design. Stitch count 66 x 114.